10 copies per pack, $19.95. The Simplified Gainsharing Training Handouts were developed for logistics organizations implementing the Simplified Gainsharing approach to improved warehouse productivity. Used in conjunction with your team meetings, supervisor training and plan documentation, the Simplified Gainsharing Training Handouts ensure strong participation from the start as workers fears are laid to rest and a new world of opportunity is opened for them. The Simplified Gainsharing program as described in Warehouse Productivity offers significant benefits for companies and their warehouse workers. The company will see increased productivity and profitability in the warehouse, while blue-collar workers will benefit from increased hourly wages, additional time off and greater job satisfaction. But what looks like a win-win program to management can look more like a threat to job security and unreasonable expectations to many hourly workers. Its your job in managing the program to show workers that Simplified Gainsharing will not hurt them and to get their buy-in early in the program. How do the training handouts help? To help you explain the program and its benefits, the creators of Simplified Gainsharing, Pat Kelley and Ron Hounsell, have written a brief 4-page handout for everyone on your team. Written in the authors straightforward, no-nonsense style, the handouts speak directly to hourly workers and address their concerns in an honest and forthright manner. Section 2. 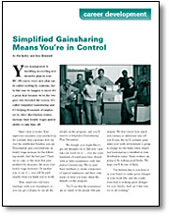 In this section workers share their real-world experiences with Simplified Gainsharing. Youll hear from Fred, who was frustrated by working harder but making the same money as everyone else. Youll hear from Shawn, whos glad he signed up early and is putting his gainshares toward a new pick-up truck. And youll hear from co-workers Denise and Annie, who find the program helps fight the boredom they faced each day. Each of the stories in this section address workers real concerns and show how they have benefited from Simplified Gainsharing. Section 3. To close the handout, the authors answer some very pointed questions about why workers should participate in the Simplified Gainsharing program and address workers fears about rising standards. The handouts are provided in packages of ten so that youll have a copy for everyone in the warehouse and everyone benefits from its powerful message. The Simplified Gainsharing Training Handouts were written by Pat Kelley, Director of Logistics for True Value Hardware where he has seven DCs reporting directly to him, and dotted line responsibility for another six DCs in the True Value network; and by Ron Hounsell, Director, Logistics Services at Denver-based Cadre Technologies, a leading innovator of fulfillment systems used by logistics service providers, distributors, and manufacturers. Together they created, refined and implemented Simplified Gainsharing programs at distribution centers across the country. They have shared their experiences with managers at industry meetings run by CLM and WERC, and in their groundbreaking book, Warehouse Productivity. The Simplified Gainsharing Training Handouts are guaranteed. If you are not 100% satisfied, you may return them within 30 days for a full refund.